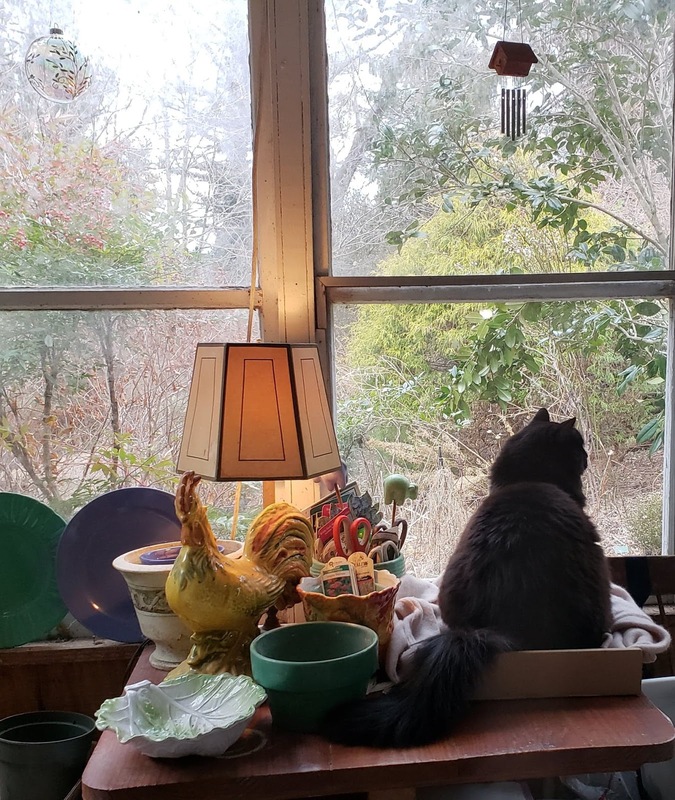 With the rise of cat celebs like Grumpy Cat and Moshow the Rapper, combined with cat videos in every corner of the internet -- it’s about time Washingtonians have an outlet to share their feline fervor with their neighbors. That’s why DC’s animal welfare organization, Humane Rescue Alliance (HRA), is hosting the 1st Annual Meow DC this coming spring. This event is generously sponsored by Nardi Media, LLC and Design Foundry. A full list of participating booth vendors is available on the event website [nardimediallc.pr-optout.com]. Tickets are $40 and on sale now at www.meowdc.org [nardimediallc.pr-optout.com]. Meet & Greet Tickets for Sunglass Cat are $15 and available at www.meowdc.org. 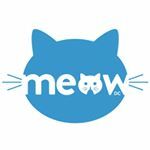 WHO: Interviews are available with HRA representatives to discuss the importance of supporting our local furry friends through events like Meow DC. Freelance writer, photographer, and editor R.S. 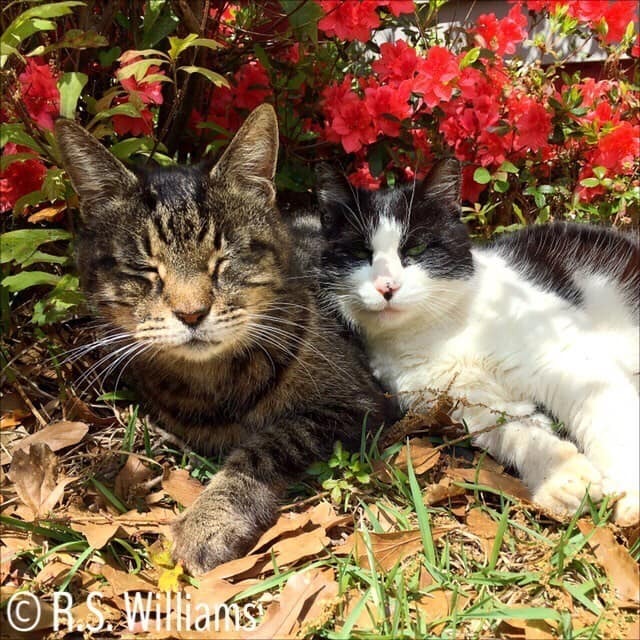 Williams of LaGrange, GA, said, "Rumpled, gray tabby Clark (left) and black-and-white Moo (right) love this sunny patch in the azaleas at the end of the porch. It’s their favorite spot for Caturday naps—and for ignoring me when I call them. [deep sigh]." Claudia M. Hosky of Washington, DC, said, "This is Lucian The Grifter. (Yes, his tag actually says that!) He roams the Cathedral Heights neighborhood in search of birds for pouncing and friendly neighbors." Heather McGann, the cat's owner, shared, "Regarding my fluffy, white, blue-eyed Persian rascal, who is named Baron von Lucian (BvL), he was dumped on my desk one day when I was working in the Middle East at a university near Dubai. His previous owner, a professor, had bought him for his new bride But, as so often happens, when dating is not allowed or strictly monitored, they didn't really know each other and it all came out after the wedding. Two months later, she left him. Every time the professor looked at him, BvL broke his heart. And he is not shy. so he wouldn't leave the professor alone to this thoughts. My husband and I intended to find him a home. We thought such a cat would be easy to place, but there are abandoned cats and dogs all over the UAE so it was not to be. When my contract was up, of course I couldn't just leave him so he traveled back to the States with me. " "Though we live in a condo, we do have a rather lovely garden/patio. It's actually larger than our condo. I think it might be 600 square feet and of course BvL is a part of what makes it lovely. Alas, he refuses to stay in our condo or even our garden and he roams. He has his rounds of people he visits. And Claudia's parent's home is one of them. He thinks everyone is on this earth to do his considerable bidding. 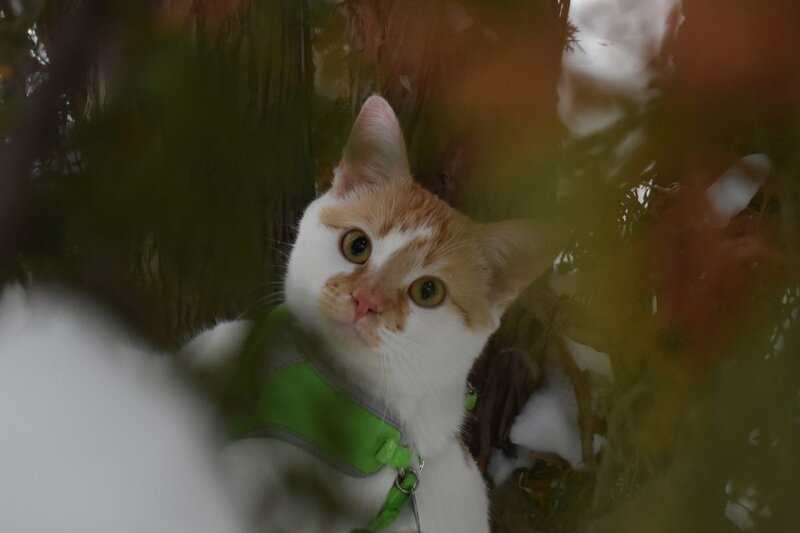 He has become a little famous in our neighborhood and people ask after him all the time. when he has withheld his love and not stopped by. 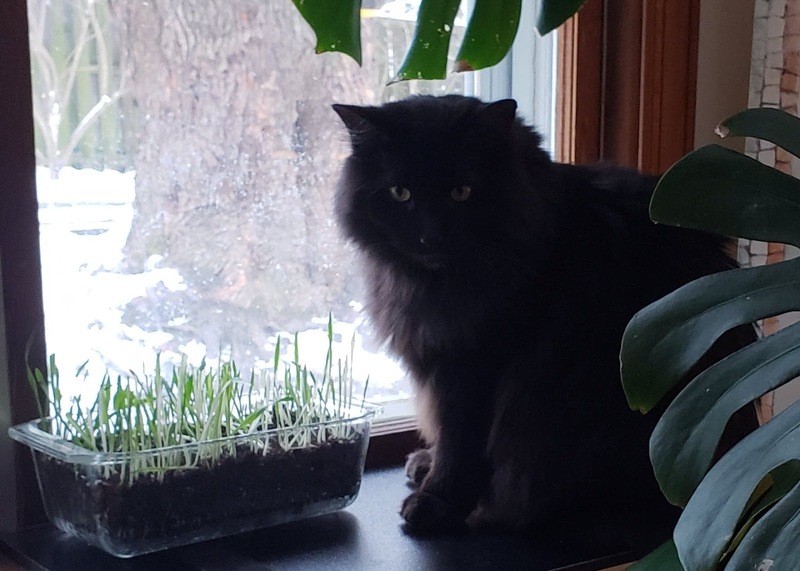 He does not like winter, so he rarely ventures out of the condo in the winter. but come spring he starts his meandering." "Once he was kidnapped...I am not making this up. My husband got a ransom call. We had to go to the police and they tracked him down for us. He was returned safe and sound. Evidently, the kidnappers wanted to keep him, but he screamed and meowed all night (he knew he was in dire straights and these new servants would be too much to train and he preferred his old servants), so they decided to give him back if we would pay a nominal fee to reimburse them for their expenses...people are incredible! No shame." 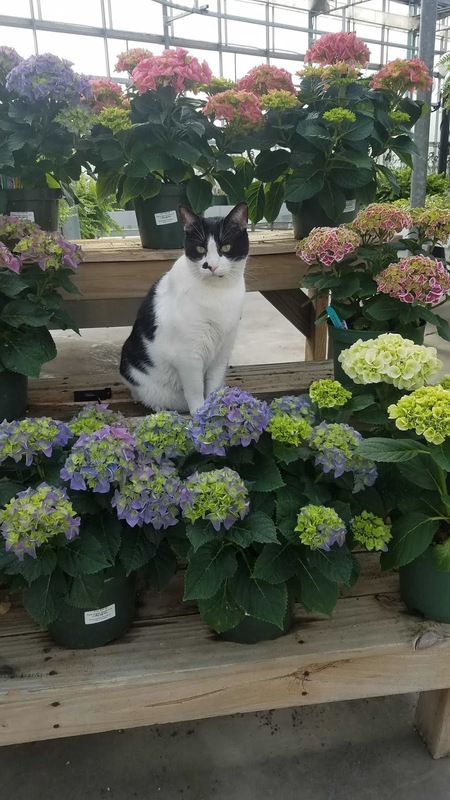 Patch is a very purr-suasive garden center cat. Who could resist buying some of his personally curated hydrangrea selections? Patch Adams was adopted by GreenStreet Gardens in Lothian, MD, from the SPCA of Anne Arundel County. You can read his full adoption story here. Stacy Greenstreet, Lothian, MD, shared that, "Patch is AWESOME! And he's also huge! We are hoping he'll slim down at least a little bit while cavorting with our customers. He's also super friendly. 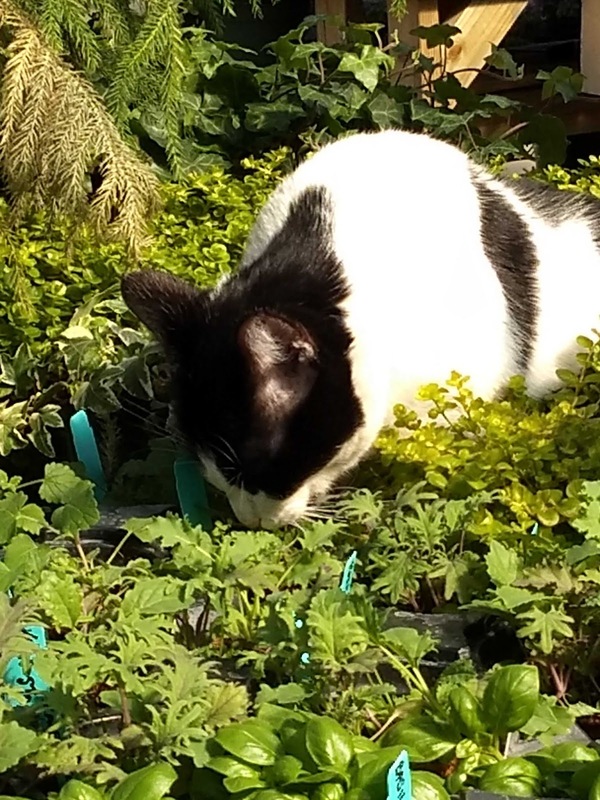 "We've also learned that Patches likes to sit ON the plants we have growing, and it didn't take him long to find the catnip. Whoops!" Blandine Galbreath shared this cute photo of cats asleep in the tomato and pepper seedling trays. She wrote: "The cats are litter mates and TNR. 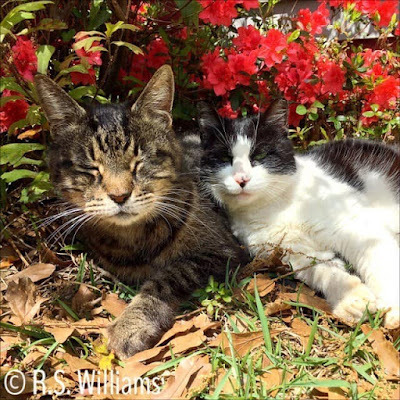 Born feral and they are now part of the menagerie at Simon Seed in Leesburg, Florida." "This is Miss Raven in my living room today. 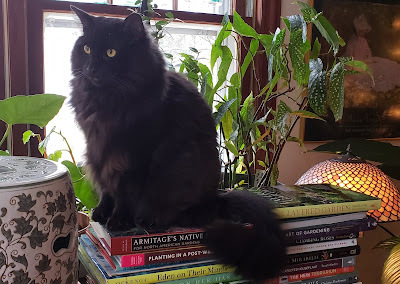 She's indoors only, but surrounded by houseplants and gardening literature. She will be four years old in April. She came home with me in May 2017, just 2-3 weeks after my beloved tuxedo kitty (Kaboodle) passed on. So Raven was unexpected, but a friend was moving and couldn't keep her. I never planned to have another cat so soon, but she has helped heal my heart. She is quite the diva and a little crazy - running & crashing around the house EVERY SINGLE DAY - and I adore her. 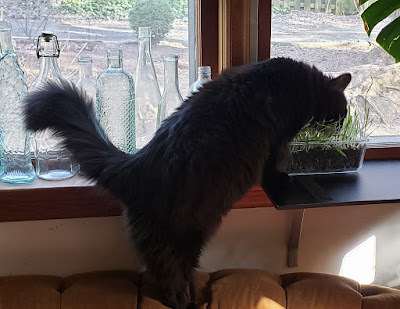 For her own indoor garden, I grow cat grass for her."